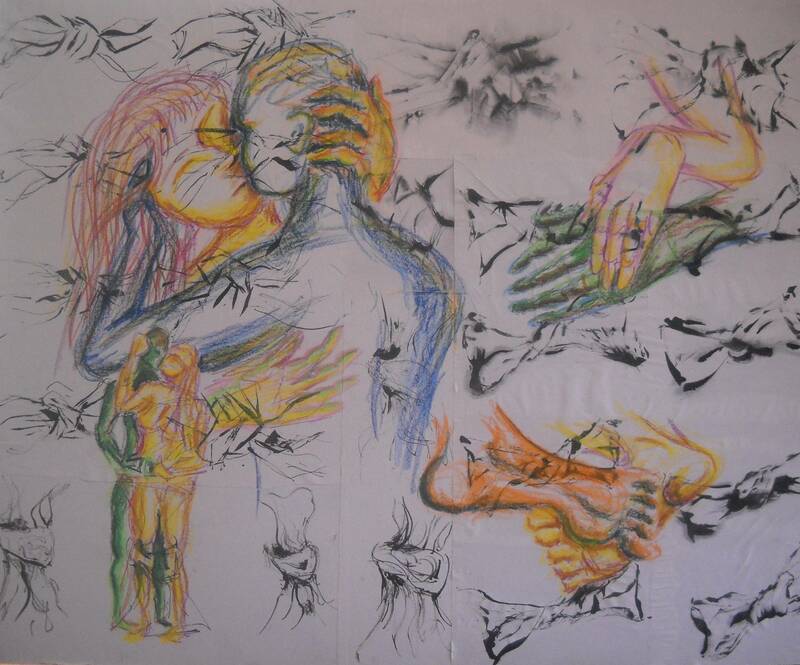 ‘Embrace’ started out as a collage of ink studies of twisted and knotted paper completed as an assignment in course early in my college career. I mounted my favorite examples of this work onto a 30×40 mounting board, beginning the journey of ‘Embrace’. At first, I was not sure what, if anything, else I would do with this piece. I simply called the piece ‘Knots’ and left it propped against our bedroom wall where I would see it every morning, hoping I’d awake with some revelation that would turn it into a masterpiece! The revelation ended up not coming from me, but from my wife Julie when she was looking at with a somewhat confused expression. She later admitted she was pondering “why did he draw all those people tangle up in their sheets?” Just the inspiration for this piece I was waiting for! The images of twisted paper knots became two things becoming one, being tied or twisted together each one holding the other. Instead of paper knots, I saw two figures dancing together, two hands grasping each other in cooperation, the passionate embrace of two lovers, and yes, two people tangled in their sheets! Three pastel drawings over these knots represent those interpretations, the passionate kiss in the top left, a loving embrace from behind in the bottom left, and two feet caressing each other in the bottom right. The image in the top right makes another twist on the idea of the knots. This drawing is taken from a picture in our wedding album, Julie’s hand over mine, showing off our new commitment newly traded rings. This is a reference to the concept of ‘tying the knot’, as marriage is sometimes referred to. Each of the images drawn of to this page are actions that ‘tie the knot’ between two people a little tighter; a passionate kiss, a surprise embrace from behind, gentle, vulnerable pillow talk after a night of romance, as well as the public vow of faithfulness. Each make our “embrace” a little closer, a little stronger, and secure its lasting presence.